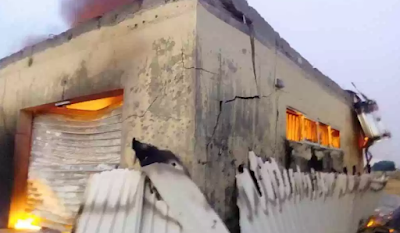 The electoral commission, INEC, has expressed concern about fire incidents at two of its local government offices. Recall there was fire breakout at the INEC office in Isiala Ngwa South Local Government office in Abia State. Another fire incident occurred late on Saturday at the Qua’an Pan Local Government Area of Plateau State. Now INEC has released a statement saying reports have been made to Acting IGP, and nothing will stop the forthcoming elections. Read the full statement below. 1. Notified the Inspector General of Police of this new trend and requested that additional security measures be provided to enhance security around INEC Offices and other critical structures of the Commission. 2. Directed the Resident Electoral Commissioner for Plateau State to open a register for all those in the affected Local Government Area who approach the Commission to collect their PVCs within the specified period. The Commission will print the PVCs and make them available for collection in good time before the elections. 3. Reprinted and delivered the Permanent Voters’ Cards of the affected registered voters in Isiala Ngwa South in Abia State. 4. Made temporary arrangements for the relocation of the burnt offices of the Commission. The said offices will be ready for the conduct of the February 16 and March 2, 2019 elections. 5. The Commission will proceed as planned in the affected Local Government Areas and all the burnt materials will be replaced in good time and as such will not affect the conduct of the elections.